So SDCC 2010 starts later today. Hard to believe it's been a whole year already, but here we are. I've just sent my secondborn child to Rustin in exchange for his services procuring all the con exclusives I want (my firstborn child, of course, having been the payment last year; it's a good thing those things only take nine months to make - that leaves an extra three months to get ready to mail it), and later tonight he'll tuck his giant testicles into his Green Lantern costume and join the rest of the dorks hoping to be the queen of Nerd Prom! In honor of that, here's something we should have reviewed a year ago, but didn't. Couldn't. Mattel is known for being a huge pain when it comes to exclusives, and it's a reputation that's not at all undeserved. They are, hands down, the single worst company to deal with. Every year is some fresh hell, and not even the insanity surrounding last year's DC Direct's Hal Jordan exclusives could compare with the utter depths to which Mattel sank. Rustin's already done the full recap, so we won't repeat it here, but suffice to say, things went very, very badly, and the worst of it all was the Wonder Twins. Before we get into the toys, we absolutely have to talk about the packaging. Frank Varela designs most of Mattel's con boxes, and always does something really cool, from the simple to the really complex. 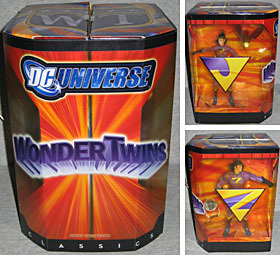 The Wonder Twins come in a mostly orange box, with a "WT" shield on the top, individual bios on the back, and one twin on each side of the box, visible behind their respective initials. 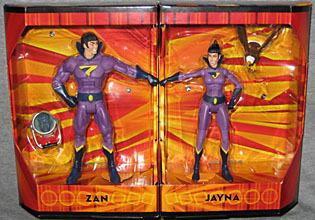 The "front" of the package has the DCU logo at the top and a retro-styled Wonder Twins name in the center, wrapping around the angled corners to the sides. The box is 9" tall, 6¼" wide and 6¾" deep. The box is wrapped in a clear plastic sleeve, with a lot of the graphics printed on it. Slide that off and you have access to the figures. You'll also notice that the box is hinged, and that the rear has a drawing of the twins' fists coming together. Hmmm. Opening the box up along that hinge brings the two figures together, and since they're each posed with an arm outstretched, the fists touch and the packaging comes to life! Lights flash and sounds from the Superfriends cartoon play: old familiar sound effects and even some dialogue between the twins; several different dialogs, in fact! Meanwhile, if you can stop watching the flashing lights for long enough to turn the box around, you'll see a nice piece of art showing the Twins activating their powers. It's a really nice presentation overall, fun to play with... and that's before you even get the figures out of the trays! 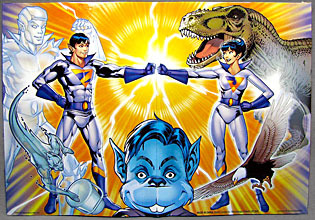 By touching knuckles with his sister and utttering the magic phrase "Wonder Twin Powers, Activate," Zan is able to transform into any water-based shape possible. Whether it's liquid, vapor, or even a solid ice structure, he always calls upon the proper "form of water" for the situation. Limited only by his imagination, his constructs go beyond simple bridges and shelters, If there is ever the need for a functioning jet made of ice - Zan is the man! Zan and Jayna didn't get any sort of an origin on the cartoon: they just showed up when Wendy and Marvin disappeared. You got the idea that they came to Earth, killed the kids, devoured Wonder Dog for sustenance, then presented themselves at the Hall of Justice as new recruits. And since every hero on the Superfriends was a braindamaged, paint-huffing version of their comicbook selves, the ruse worked. They did, however, get a backstory when they were introduced to comics, in Super Friends #7. They were rare shapeshifting aliens from the planet Exor, sold as freaks to an intergalactic circus, which explains why their costumes look like they came out of a carnival act. Zan apparently uses the "large" DCUC body? I don't know, I swear to you, the only difference I can see between them are the holes in the back. Zan's got a rectangular one, which is generally the sign of the big body, so there you go. To complete his costume, he shares Romat-Ru's boots and Dr. Fate's gloves, plus a new belt and collar. Zan's clean, wholesome voice was provided by Michael Bell, an '80s mainstay who did tons of famous voices for both GI Joe and Transformers. Since the Twins' role in the series was to never do anything at all right, Zan came across as earnest but stupid: with his plastc grin and the rapeiest eyes ever seen on a toy, this one is substantially more sinister. He's got short, pointed ears, and his haircut is appropriately blocky. The figure has all the normal DCUC joints, and they all work well - even his neck balljoint, because he was made before Mattel messed that up and refused to admit they'd done anything wrong. 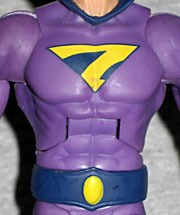 The majority of his suit is purple; the gloves, boots, belt and collar are blue; the trim on his boots and the circle in the center of his belt are yellow; the stylized Z triangle on his chest is yellow over blue, but they really should have used a more solid paint, because the yellow ends up looking dark. Combined with the powers of her twin brother, Jayna is able to turn into virtually any beast on Earth or beyond - from a mythological griffin to an extinct dinosaur or even a creature from a distant planet. Jayna often assumes the "form of an eagle" to deliver urgent news or to cover great distances quickly. And if a ring-tailed lemur is the key to keeping evil at bay, Jayna is your mammal! But she's not a mammal. She's an alien, remember? 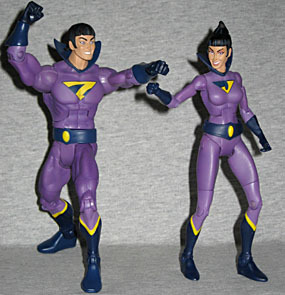 The Wonder Twins were eventually introduced to the "real" DC Universe in Extreme Justice #9, and they were still from the planet Exor, but this time they were only one of five pairs of twins - essentially the planet's ruling families. Each of the twins could control one of the "Ten Elements of the Universe," which allowed their ancestors to protect their home planet: Zan was water and Jayna was animals, but the others were fire, rock, vapors, plants, sound, metal, shadows and electricty. You thought Zan and Jayna were stupid on the cartoon? Imagine Zilax and Jod fist-bumping and yelling "Form of a fireball! Shape of a rock pile!" All of a sudden the Wonder Twins we got don't seem so lame. No surprise that Jayna uses the standard female body. Of course, unlike some characters, it's perfect for her. 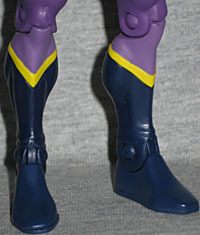 She shares her shins with Karu-Sil, but her forearms seem to be new: none of the other DCUC women have gloves like this. Mattel could have easily cheaped out and painted her gloves on, but they did one better. She gets the belt and the collar, of course, and her yellow paint seems better than her brother's. Jayna's face is nearly as creepy as big bro's, but her '60s stewardess hairdo makes it more of a Stepford Wives thing than the unblinking creepshow that is Zan. The top of her head ends up looking like the tip of a Dairy Queen cone. Compared to the cartoon, the hair looks kind of tall and narrow; it needs more "body," as the shampoo commercials say. They did a nice job making her curly sideburns look different from Zan's, though. There's one major flaw with Jayna: for some reason, her waist joint won't move. This isn't just a case of some errant glue, or too much paint making the joint stick; the thing is quite literally fused in place. Her waist will never move, no matter what you do to it. You can put her in the freezer for hours, or dip her in boiling water, and the only thing that will ever happen is that the waist joint will snap and you'll be stuck gluing her. On the plus side, no articulation will be lost in the process, but just save yourself the time and headache and leave the waist alone. 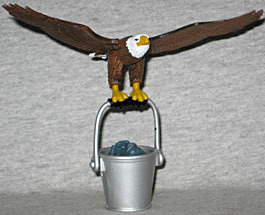 The set includes two accessories, thematically appropriate for the set: a bucket of water, and an eagle. Yes, just like they call out when you open the box. And yes, just like they did on almost every episode of Superfriends. The bucket is new, obviously, and the water in it is molded with Zan's face - it's so exact, in fact, that I wouldn't be surprised if it was made directly from the same sculpt. It's cast from translucent blue plastic, but light can't really pass through since the bucket is solid. The eagle is the same mold used for Beast Boy's animal form and a couple of the MotU Classics, but this is where it originated (you can tell since it's actually in-scale for DCU, as opposed to being way dwarfish for MotU's oversized releases). Same high quality on the sculpt, same joints in the wings and legs, but a more realistic paint job: brown body, yellow feet, white head and tail... it's majestic! It can even grip the handle of the bucket to carry it around! And you know what? That's lovely and all, but you notice what's missing? MUTHAFLIPPING GLEEK! Gleek, the Space Monkey that was a defacto part of "the Wonder Twins?" They never appeared without him, and when someone says "Wonder Twins," what do you think of? If you said anything other than "two teens and their monkey," your name is Scott Neitlich. 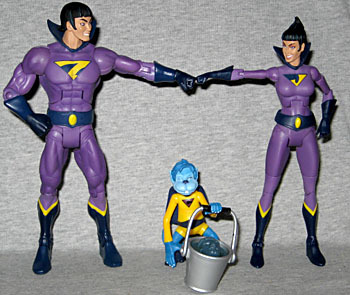 Remember how we said that the Wonder Twins' original origin was that they were sold to a space circus? While they were there, they befriended Illik the Laugh-Maker (ie, space clown), and his pet elasti-monk Gleek. They eventually ran away from the circus - all the other performers got paid, but they didn't, so they stole a rocketship as compensation and split. When they did, Gleek went with them. Let's imagine that with every friend he had in the world abandonning him at once, Illik later hanged himself in his tent. The horror story that was Gleek was covered in the "Getting Matteled" PoA, so for the backstory, go read that - we're trying to remain positive, here. Gleek was given away in his own little plastic baggie, because there's no room for him in the Wonder Twins box. He stands 2¾" tall and is 100% new sculpt! I know, I know: we were expecting him to be a repainted Sinestro, too, but nope! The Four Horsemen did a really nice job creating Gleek. He truly does look like an untooned version of the old familiar monkey, from the purple booties on his feet to the thick blue "hair" on his head. Seriously, why does a monkey have a haircut? His exposed body has a furry texture, and the face is quite excellent. It's a great-looking piece, made insulting by the fact that most people will never see anything but a photo. However, for you fans of sour grapes, there is some good news: Gleek's articulation is for crap. The limbs are very gummy, so getting them to move (without tearing) is difficult at best. Looking at him, he should have swivel hips and shoulders, but I was having no luck getting any of them to work. After the usual rounds of heat and cold, they still weren't working. Cracking open the torso revealed why: stupid construction. Everything from the top of the neck to the bottoms of his feet are one single piece. There are no joints there, just a lump of rubber that can't be moved. 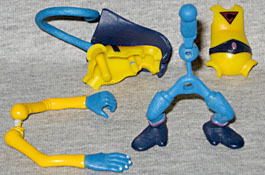 The arms are a second single piece, connected by a thin strip that runs behind the "neck"; there's no way to move one arm without moving both, and because of the way the PVC pieces "grip" each other, the arms really don't want to move at all. The neck is a balljoint, which is the one redeeming feature, but the "prehensile" tail doesn't move in the slightest. The whole thing really is done in the worst possible way. Speaking of which... you saw Mattel's excuses in Rustin's article (including their bald-faced lie about saying there would be less Gleeks than WTs at the show). 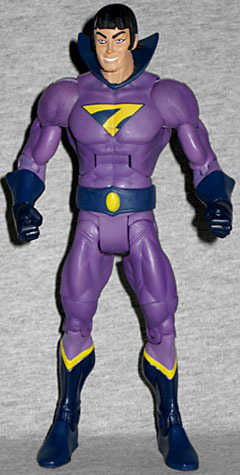 They kept comparing Gleek to previous exclusives, like Keldor or Solomon Grundy, but that misses the point: we asked Mattel about it, and they contended that Gleek wasn't "part" of the Wonder Twins, that he's just an accessory. The hell he is! Selling the Twins and giving out Gleek separately is like selling Batman and giving out his arms separately, then acting mystified when fans get angry. It's even worse when you consider that the damn bucket the set comes with is technically the monkey's accessory, not Zan's! So in our theoretical Batman analogy, he's not sold with any arms, but he still comes with a batarang. That is why fans got pissed, and that is what Mattel never addressed. The smart thing, the logical thing, would have been to include Gleek in the set, and make the bucket and eagle the extra giveaways. But no.